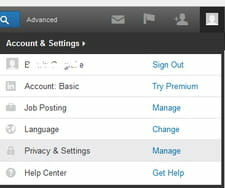 When you install a 3rd party application in LinkedIn, it is most likely that it will request access to some of basic profile and contacts information, which may include photos, names, phone numbers, connections, email addresses and other personal details. Published by jak58. Latest update on June 8, 2015 at 11:09 AM by jak58. This document, titled "Prevent LinkedIn from Sharing Data with 3rd Party Apps," is available under the Creative Commons license. Any copy, reuse, or modification of the content should be sufficiently credited to CCM (https://ccm.net/).